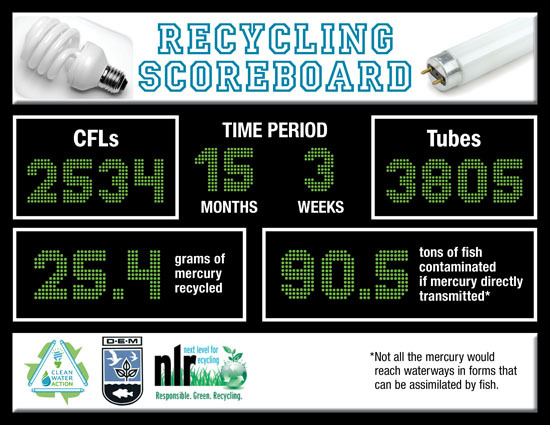 Local hardware stores have recycled over 6,000 light bulbs containing mercury as part of Clean Water’s mercury reduction pilot program. The fourteen retailers collect burned-out compact fluorescents (CFLs) and linear tubes up to 4 feet long from their customers. Employees pack the bulbs into pre-paid containers for shipping to NLR’s recycling facility in Connecticut. The project has kept more than 25 grams of mercury from entering our environment. The pilot program helped us make headway with the state legislature on a bill to require bulb manufacturers to pick up the tab for residential recycling. To make sure we continue the momentum, Clean Water is handing the program off to Rhode Island Resource Recovery. They are ensuring that Rhode Islanders can continue to drop off their spent bulbs for recycling close to home. We're going to keep the pressure on our elected officials to pass a statewide mercury recycling law.